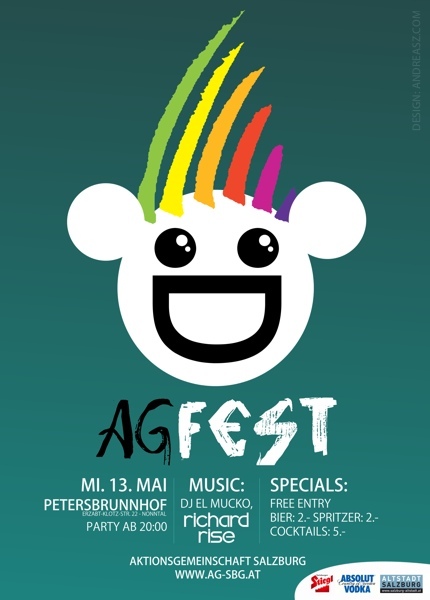 The task was very simple; to create a Logo for the AG Fest, a party organized by the “AktionsGemeinschaft Salzburg” (link) with only one condition: it should include their rainbow Logo. I first tried to create a more serious text only logo with variations of the rainbow theme, but it didn’t work out that good so i decided to try a completely different approach by thinking of ways how to use the original rainbow logo. I hope I succeeded in creating a Logo/Poster Design that will stick in your mind when passing it on the street. By the way: we are going to be there, djing (and hopefully also doing Live Visuals) as Richard Rise and would love to see all you Electro-Lovers there. After I originally left a comment I appear to have clicked on the -Notify me when new comments are added- checkbox and from now on every time a comment is added I recieve 4 emails with the exact same comment. Perhaps there is a means you can remove me from that service?Thank you!Also visit my blog post – ????????????? ‘This week, I will only drink one beer on Friday night, saving myself thousands of calories’. Peter Ragnar’s ‘How To Build Muscle On A Raw Food Diet’. For anybody who is scanning this report, I would guess that you are looking to register with Visalus chloe and isabel review so are searching around for reputable information about Visalus Sciences.